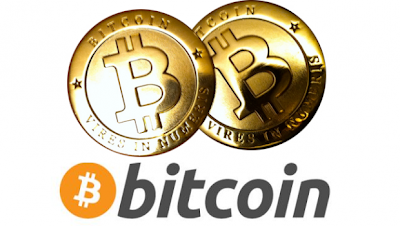 Bitcoin is a peer-to-peer digital currency that functions without the intermediation of a central authority. The concept was introduced in a 2008 paper by a pseudonymous developer known as "Satoshi Nakamoto". Bitcoin has been called a cryptocurrency because it is decentralized and uses cryptography to control transactions and prevent double-spending, a problem for digital currencies. Once validated, every individual transaction is permanently recorded in a public ledger known as the blockchain. Payment processing is done by a network of private computers often specially tailored to this task. The operators of these computers, known as "miners", are rewarded with transaction fees and newly minted Bitcoins. However, new bitcoins are created at an ever-decreasing rate. Bitcoin is traded from person to person, rather than through banks. In a conventional financial system, new money is created by a central bank, such as the Federal Reserve. But the Bitcoin network doesn't have a central bank. So the system needed an alternative mechanism for introducing currency into circulation. Unlike traditional money, bitcoin exists only online. To create, or "mine," the currency, computers guess solutions to complex math problems and send them to other computers on the bitcoin network. As time goes on and more coins are mined, it becomes more difficult to create bitcoins. Right now, about 12 million bitcoins have been found, with about 9 million yet to be discovered. There will never be more than 21 million bitcoins in circulation. Once created, bitcoins can be traded on currency exchanges or used as money to purchase goods and services from merchants that accept it. Its limited supply has made bitcoin attractive to people worried about inflation, while its anonymous nature makes it a favorite among those making illegal transactions. There's a chance that it ends up taking over at least part of gold's traditional role as a store of value. Bitcoin's decentralized architecture means that it is the world's first completely open financial network. To create a new financial service in the conventional U.S. banking system, you need to partner with an existing bank and comply with a variety of complex rules. The Bitcoin network has no such restrictions. People don't need anyone's permission or assistance to create new Bitcoin-based financial services. The price has been extraordinarily volatile -- it lost more than 90 percent of its value between June and October 2011, for example. But there's also been an unmistakable upward trend. Bitcoin has captured the imagination of venture capitalists. A startup called Bitpay, which processes Bitcoin payments on behalf of vendors, raised more than $2 million earlier this year. Coinbase, a startup that helps consumers buy and sell bitcoins, has raised $5 million. And last month, a Bitcoin startup called Circle raised $9 million. "Every informed person needs to know about Bitcoin because it might be one of the world’s most important developments!" - Leon Louw, Nobel Peace prize nominee. 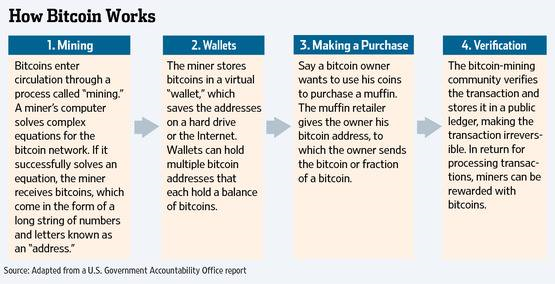 Once a bitcoin is created, it can be sent between users using digital addresses and stored in virtual "wallets," which have passwords that guard access to the bitcoins. If the passwords are lost or stolen, the bitcoins are lost forever. Investors can also purchase bitcoins online through websites such as Slovenia-based Bitstamp.net, San Francisco-based Coinbase.com and Tokyo-based Mt. Gox. In addition, a number of alternative digital currencies have sprung up, with names such as litecoin and peercoin, though none is remotely as popular as bitcoin. For now, relatively few mainstream merchants—including dating site OkCupid and blogging platform WordPress.com—take bitcoins for goods or services, though the number is growing. Many merchants use services that, for a fee, immediately convert bitcoins into dollars. High-risk experiment though it may be, bitcoin embodies an elegant and disruptive technology. It uses file-sharing, the peer-to-peer computer innovation that spawned early music services like Napster, Kazaa and LimeWire. 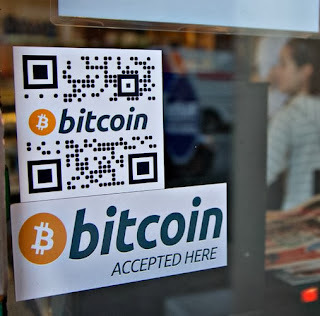 In the meantime, the virtual currency’s soaring value has inspired tales like this one: Kristoffer Koch, 29, of Oslo, told the BBC last month that he bought $22 worth of the currency while doing technical research on it four years ago. He promptly forgot about it. When he unlocked his long dormant account recently, it was worth $850,000. One option is to mine them yourself, but that's not a good choice for beginners. For everyone else, your best bet is to purchase them with a conventional currency. Web sites known as exchanges will let you trade bitcoins for conventional currencies with other users. Even more convenient are companies like Coinbase, which will withdraw cash from your bank account and convert it to bitcoins at the current exchange rate. A few Bitcoin ATMs are popping up, which will directly trade paper money for Bitcoins. A bitcoin ATM opened last month at a Waves Coffee House in Vancouver, British Columbia. 2008: Satoshi Nakamoto, the mystery man or group behind the creation of the Bitcoin system, issues a white paper outlining a system that would allow people to exchange a digital currency. To this day, no one has come forward as Nakamoto and attempts to discover his identity have failed. Early 2009: Nakamoto unleashes a web of complex algorithms, creating bitcoin, a virtual currency. The program allows anyone to seek, or mine, bitcoins, by solving math puzzles. People can also buy bitcoins on exchanges. The rub: There are a finite number of bitcoins – 21 million. 2011: In a key development, BitPay, a payments processor that allows e-commerce merchants to accept bitcoins, begins operating. BitPay allows both users and senders to remain anonymous by transferring bitcoins between digital wallets that can be set up on computers and mobile phones. 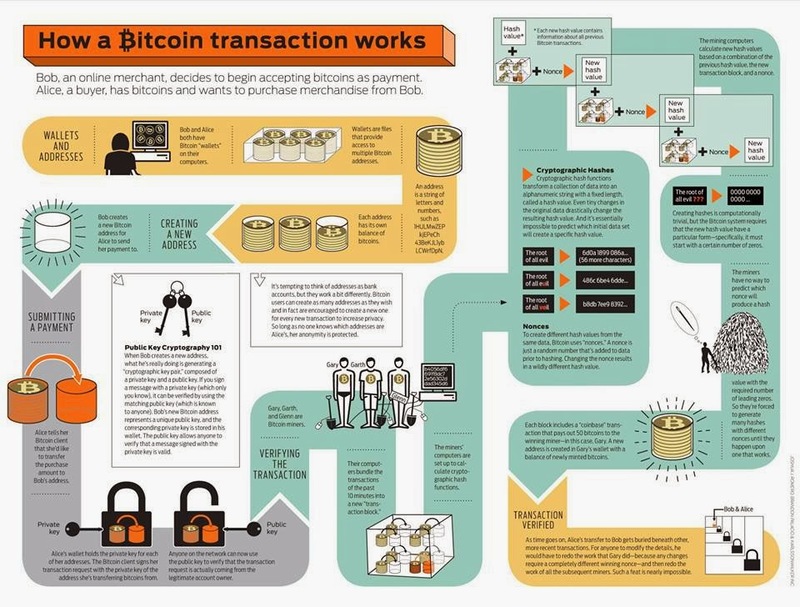 The program tracks each bitcoin to prevent counterfeiters. 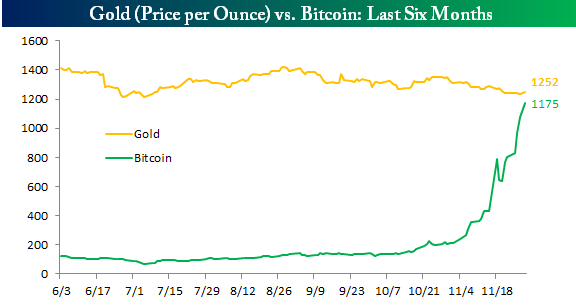 Mid-2011: The value of bitcoins begins surging, propelled by increasing media attention that helps drive the value of bitcoins to a peak of nearly $32 in June, from less than $10 earlier in the year. But the currency then goes into freefall, declining to about $2 in October. 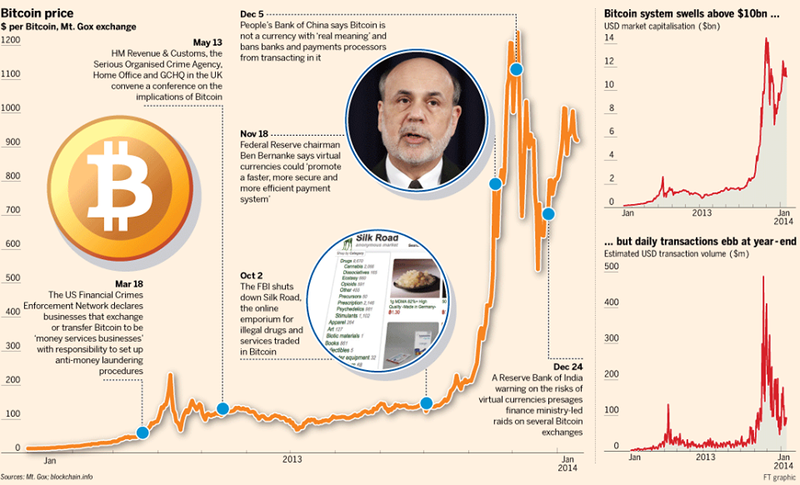 July 2012: Bitcoin Foundation, a trade group focused on developing Bitcoin standards, is formed. The group says its mission is to make Bitcoin a more trusted currency by investing in infrastructure that will provide more stability to the bitcoin community. 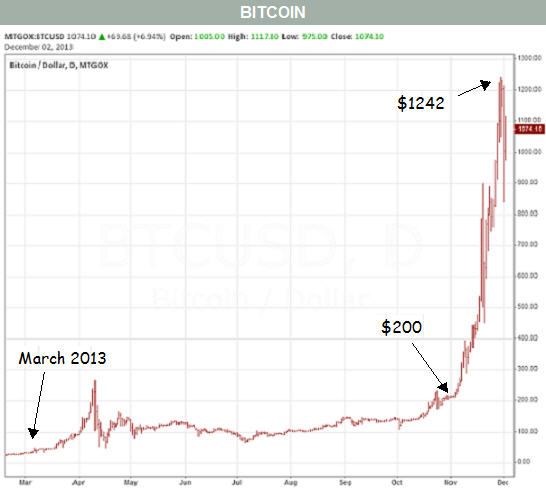 The value of one bitcoin starts 2012 at about $4 and gradually rises to slightly more than $13 by year's end. 2013: The Libertarian Party begins accepting bitcoin donations through BitPay. March 2013: The value of bitcoins surges once more as the island nation of Cyprus plunges into crisis. European officials threaten to tax deposits in Cypriot banks, prompting some analysts to suggest residents might consider transferring their wealth into bitcoins. The value of a bitcoin soars to $90 by late March. March 18, 2013: The U.S. Treasury Department's Financial Crimes Enforcement Network issues guidance about how rules that apply to money transmitters, such as Western Union and MoneyGram International, affect virtual currencies. Market watchers say that move brought more legitimacy to Bitcoin. April 10, 2013: The value of a bitcoin plummets to $105 from $266 as trading is halted on one of the largest Bitcoin exchanges: Mt. Gox. Mt. Gox, based in Japan, says it was hit by denial-of-service attacks and was overwhelmed by trading volume. May 15, 2013: U.S. government deals a blow to the burgeoning Bitcoin revolution, freezing the account of a U.S. subsidiary of Mt. Gox. The account was held at online payments firm Dwolla, according to a warrant provided by the Department of Homeland Security. July 1, 2013 : Cameron and Tyler Winklevoss, who have said they own about 1% of the world’s supply of bitcoins, file for an IPO of shares in the Winklevoss Bitcoin Trust, designed to allow investors to track the performance of Bitcoin. The proposal faces a difficult road to regulatory approval. July 23, 2013 : The Securities and Exchange Commission charges Trendon T. Shavers, the Texas-based founder of a website called Bitcoin Savings and Trust, with running a Ponzi scheme promising big returns on bitcoins. August 2013: New York's top banking regulator issues subpoenas to roughly two dozen companies associated with Bitcoin as part of a wide-ranging inquiry into the business practices of the fledgling virtual-currency industry. Oct. 1, 2013: FBI takes down Silk Road, an Internet drug market that relied on Bitcoin. Oct. 14, 2013: A unit of Baidu Inc., the Chinese search giant, begins accepting Bitcoin for some Cybersecurity services. Nov. 1, 2013: Alydian Inc., a company with ties to Bitcoin promoter Peter Vessenes formed to help customers mine bitcoins, files for bankruptcy protection. Mr. Vessenes blames a lawsuit over a contract and the race to mine bitcoins ever more quickly, which has boosted the cost of equipment and power to perform the necessary computations. 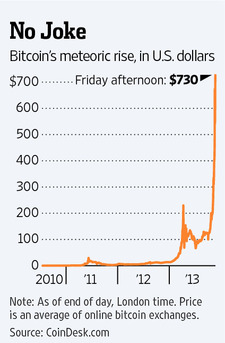 Nov. 13, 2013: The price of a bitcoin rises above $400 on the Mt. Gox exchange, setting a record.